Please see exhibit A on the left. That was the highlight of the movie for me. Call me shallow, or dumb, or both, but I did not see all the greatness in the movie. I even watched the extended version. And it felt like many other book adaptations do when they try to stay true to the book--to the point that you need the book to understand what the hell is going on. So after watching all of three hours of the movie and feeling thoroughly confused by most of it, I spent another two hours reading up on the Dune universe on Wikipedia. It all started to make sense after a while. Again, call me what you want, but in my world, a movie, even if a direct adaptation of a book, needs to be able to stand on its own, as a work of art in its own right, finished and contained within itself. Definitely not needing additional reading. Not to say that I hated the movie, just felt vaguely disappointed and vexed that it required so much background knowledge to appreciate. All of the said background knowledge being completely (and purposely) irrelevant in my universe, so not like anything I know about anything applied. 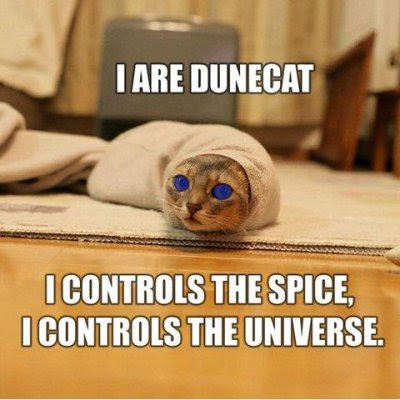 So in the end, I can slightly better appreciate the Dune lolcat, and that's my lesson for today.